Operator theory is a very broad and active branch of functional analysis which has strong connections with several other areas of mathematics, such as complex analysis, geometry, algebra, ordinary and differential equations, and mathematical physics. However, in spite of the very large number of mathematicians working in operator theory, the percentage of female researchers in the field is very small. This imbalance is quite significant even when comparing with analogous situations in other branches of mathematics. promoting dialogue in a friendly atmosphere. The programme will consist of several plenary 40+5 minute talks, invited 25+5 minute talks, and a very small number of contributed talks/posters. A preliminary list of speakers is available. The workshop has no registration fee and is open to everybody interested. However the number of participants will be limited in order to foster fruitful dialogue in a friendly atmosphere. Therefore we ask those interested in attending to send an email to one of the organizers. 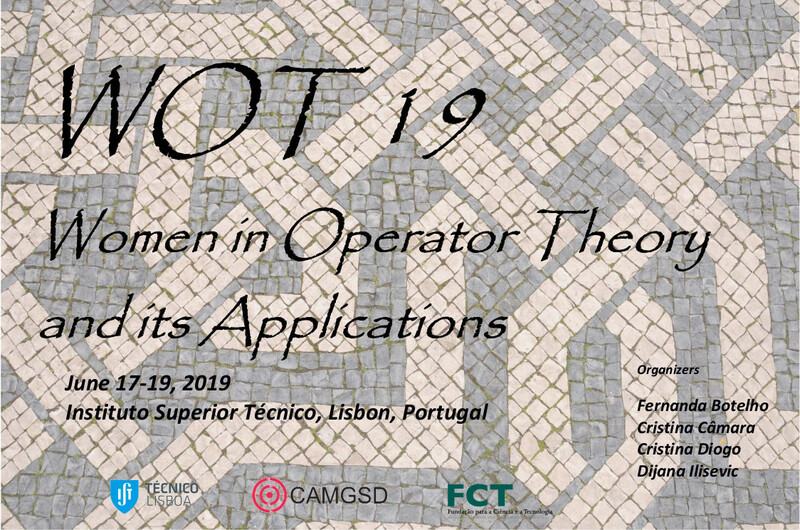 This meeting is supported by CAMGSD / Center for Mathematical Analysis, Geometry and Dynamical Systems of Instituto Superior Técnico, University of Lisbon. The organisers thank João Aguiar Câmara for the photos. Não remover este elemento. É essencial para o splashscreen. Este parágrafo não é visível.